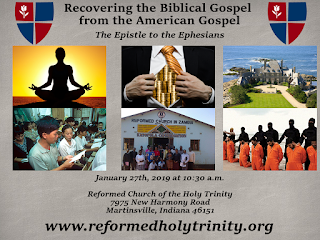 This Sunday, January 27th, 2019, Reformed Church of the Holy Trinity will begin preaching through the book of Ephesians. We have titled this expositional series of Ephesians as Recovering the Biblical Gospel from the American Gospel because, in making application, we will see that the America gospel is corrupt. There is an obvious reason for this corruption—American Christianity is apostate. From Joel Osteen to Andy Stanley; from the mainline denominations to the New IFB Movement; American Christianity has rejected the God who called us into the grace of Christ unto a perverted gospel. These are hard words to hear by those who are full of self-love, self-importance, self-righteousness, and self-rule, but it is the truth. Most of what passes itself off as American Christianity is inconsistent with Biblical proclaimation. An elementary reading of Scripture combined with a general perusal of American doctrine and practice is sufficient to know “something is rotten is Denmark,” or, in this case, the American Church. It has become so rotten it stinks to high heaven as is obvious by the removal of the Spirit of God in our society. Needless to say, we have not learned by the multiple examples of the children of Israel in their rebellions against God and His Word. It is no wonder pulpit pimps like Andy Stanley want to “unhitch” the Old Testament from the New Testament. We do not want to be disturbed in our stroll on the highway to hell. The American false gospel is all about the self, which is antithetical to the Biblical gospel. It is a gospel, falsely so-called, which is all about the glory of the creature rather than the glory of the Creator. It does not matter if it is the Word of Faith heresy in its health, wealth, and prosperity gospel in the here and now or the easy-believism version of the hereafter. All versions are about the glory of man based upon their own narcissistic love of self when the Biblical version is all about the denial of the self. The worst thing about all these self-centered gospels is the lost opportunities to reach the world with the gospel. The world is full of sinners who need a real Savior and we are exporting the American Dream in the name of Christ. We have so many opportunities today that are being wasted on cosmopolitan Christianity. Most professing Christians are selling all that they have for their best life now because their “christ” is really just a genie for their self-indulgent desires. This is the reason they sing praises to, pay tithes to, and proclaim their salvation through their essential oils, CBD oil, fitness program, or some get-rich scam. They are more interested in looking good, feeling good, and living good than they are about denying ungodliness and worldly lusts in order to live soberly, righteously, and godly, in this present world (Titus 2:12). What all of this is really about is health, wealth, and prosperity rather than worshiping God, serving Christ, and reaching the world with the gospel. The reason why professing American Christians are so selfish is because they have never been born again. And no wonder since they do not know the gospel, at least not the Biblical gospel. They know the secular gospel, the libertine gospel, the affluent gospel, the suburban gospel, the urban gospel, the hillbilly gospel, or any other gospel as long it is about them—their free will, their self-worth, their success, and their prosperity. All the while the world, beginning with our Jerusalem, Judea, Samaria, and even the uttermost part of the earth, is groaning for the revelation of the sons of God. The problem is that those who say they are the sons of God are no different than the sons of Adam. We have the greatest opportunity to build and advance Christ’s holy Church, but those who say they are the Church are AWOL. The Bible is very clear about those who profess to be in Christ but are absent from the true Church: “They went out from us, but they were not of us; for if they had been of us, they would no doubt have continued with us: but they went out, that they might be made manifest that they were not all of us” (1 John 2:19). We may have a hard time identifying what this American apostasy is since it contains a little bit of every major historical heresy in history, however, in dealing with all the heresies in the First Century, Jude generalized them as those who turn the grace of our God into lasciviousness by denying the Lordship of Jesus Christ (Jude 1:4). This cardinal dogma of this false gospel is the rejection of Jesus as Lord and the acceptance of the Satanic lie that we can be our own gods. It is the glorifying of our own flesh. However, in rebuking those who desired to make a show of the flesh, Paul very emphatically told the Galatians, “they that are Christ’s have crucified the flesh with the affections and lusts” (Galatians 5:24). The answer to the question, “What are you crucifying and what are you living for?” identifies the gospel you are trusting for your salvation. The American gospel answers this question radically different than the Biblical gospel. 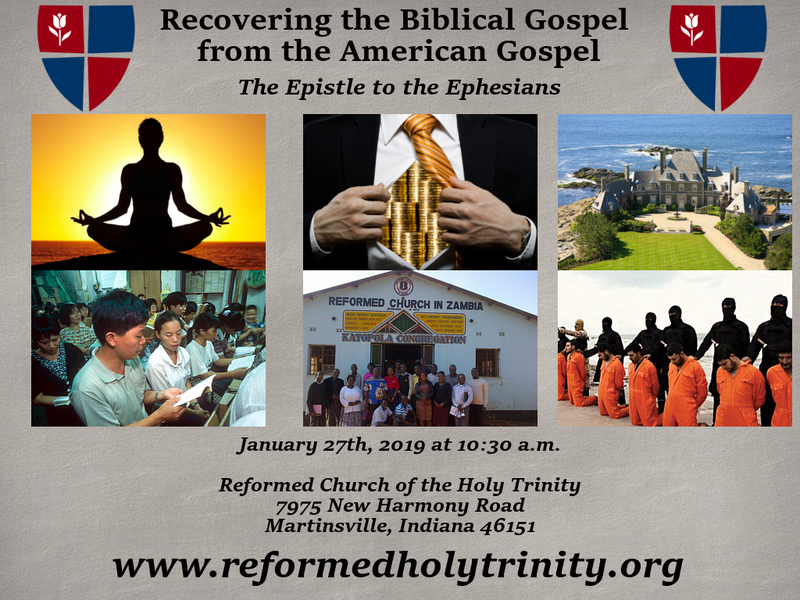 If you live in central Indiana, we hope you will join us at our physical location (7975 on New Harmony Road, Martinsville, Indiana 46151) as we recover the Biblical gospel of Jesus Christ in the Epistle to the Ephesians. If you do not live in our region you can watch the live stream or archived sermon videos on our Facebook Page or our YouTube Channel. May God be gracious to us in calling us to Jesus Christ by the power of the Holy Spirit through the Word. And, may God revive His Church to take the gospel into the whole world!